Lexmark Models - XJ-350, 1100... Not compatible with the Lexmark Z11. Fully compliant with USB Specification Revision 1.1 (also works fine on USB 2.0 ports). Fully plug & play compatible. IEEE 1284 interface supports bi-directional communication. Supports suspend / normal mode power management. Provides a 1284B centronics connection. Provides faster downloads to your printer since the USB interface provides 12 Mbps versus only 150Kbps speeds through a standard parallel port. 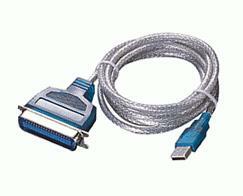 Once plugged in, cable will map in as USB Printing Support under USB001, or USB002, etc. After plugging in the cable and connecting your printer, under the Control Panel in Windows, select "Devices and Printers" or "Printers & Faxes" (depending on version of Windows) and then select to Add a Printer and follow the on-screen instructions. If the printer is already installed on the system, bring up the Control Panel, go to "Devices and Printers" or "Printers & Faxes" and bring up the Printer Properties for the printer you are installing by right clicking on it and selecting "Printer Properties". Click on the "Ports" tab, and select the highest numbered USB port you see listed (such as USB002) and click the 'Apply' button. Then, under the General tab, select to print a test page to verify that everything is working properly. If it does not print, please make sure that the power to the printer is on, the printer is in an on-line mode, and that the printer is on-line in Windows. If everything seems correct, please try rebooting. To use this adapter on a MAC computer, you will need to download and use the Gimp-Print drivers. We do not provide support for these drivers as they are developed by a 3rd party. They can be downloaded here: http://gimp-print.sourceforge.net.